Recently, my spouse came home from work and shared unexpected news. We have military orders to a new assignment. Apparently, we will not be enjoying the upcoming season in this home. The good news is that we could easily be stationed here again. With that in mind, we’ve decided to keep our home and rent it out. Now the real fun begins! What do we need to know as we take on this new role as a landlord? Thankfully, MilitaryByOwner has answers for the many questions we have. Are you facing an unexpected change of assignment? Or do you anticipate an upcoming military move? If you're in the same spot we are, here are a few points to get the ball rolling as a landlord. By virtue of being a landlord, you’ve now started your own business. With that in mind, it’s a good idea to be as organized as possible. Make a plan to record all receipts, whether in a file or by taking photos on your phone. Keeping receipts in order also helps when you need to itemize your deductions at tax time. It may not be a real page-turner, but you'll want to read through the state and federal fair housing laws. Visit the U.S. Department of Housing for documents that detail the Fair Housing Act. Learn more about this topic in our post, Understand the Fair Housing Act When Listing Your Property. A little bit of homework now will prepare you if any unexpected legal issues arise later. When looking for accurate forms to address the legal requirements, MilitaryByOwner offers various options via U.S. Legal Forms. 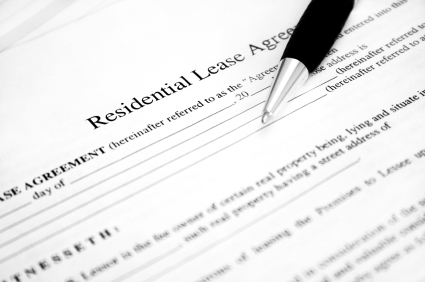 Use your Residential Lease Application form to screen for an ideal tenant. Most prospective tenants understand the need for credit and background checks. No matter if the candidate is a referral from a friend or a co-worker, treat each applicant the same. When initiating a Residential Rental Lease Agreement from U.S. Legal Forms, consider the timing. What length of time do you want a tenant to reside in your home? 6 months? 1 year? 2 years? In our case, we are unsure how long our new assignment will be. We hope to find a tenant to lease our home for at least one year with the option to renew if they prefer to stay another year. All these little pieces (and more) fit together to create a bigger picture, personalizing the lease for your home and your situation. 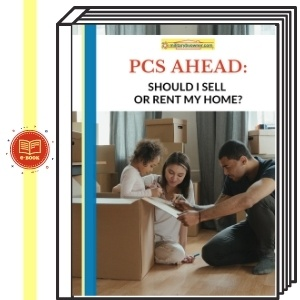 Download MilitaryByOwner's free ebook created to walk you through these issues: Landlord/Tenant Ebook. 5) Think like a tenant. As for the home itself, consider a walk through of your property as if you are seeing it through another person’s eyes. This will highlight any repairs that need to be done before a tenant moves in. "Move-in ready" is what renters are looking for! 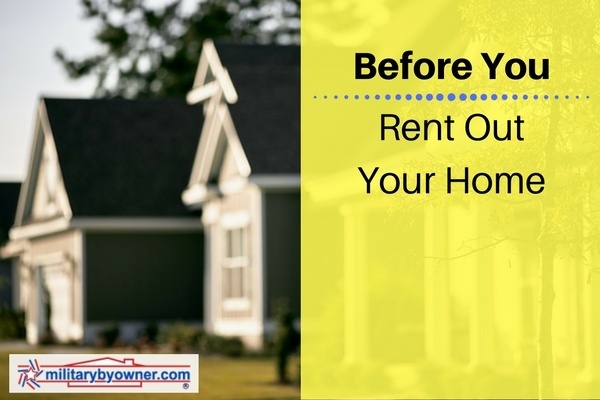 Our post The Ins and Outs of Turning Over a Rental Property will give you great tips and checklists for this process. Paperwork? Done. Repairs? Complete. Now it’s time to list your property. As we outline in our post How to Create an Unforgettable Home Listing, the steps to building an online listing are as user-friendly as possible. Which school district is the property zoned for? What amenities are in the area? List a community swimming pool, local parks, or convenient shopping or dining. 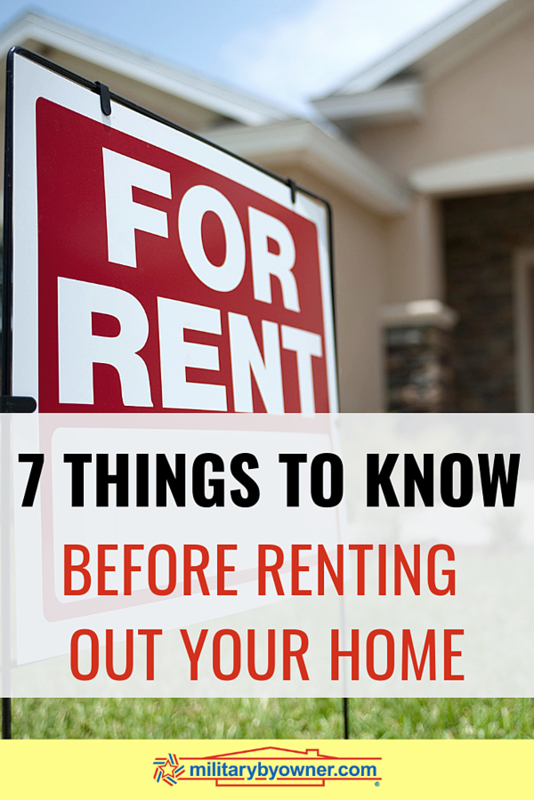 7) Draw potential renters in with photos. Most people looking online for properties are immediately drawn to listings that include a photo. To keep a viewer interested, you'll need to photograph your home at its best. It will set your listing apart! After creating your super star listing on MilitaryByOwner, share, pin, favorite, post, tweet--whatever it takes to get the word out! Use popular social media platforms like Facebook, Twitter, Instagram, and Pinterest to do the work of marketing for you. If, like our family, you need to rent your home before leaving for a new military assignment, rely on the numerous resources we provide, including those for property managers and landlords. The idea of becoming a landlord will be far less intimidating!